Fifty-two countries represented, $500 million in sales reason to celebrate the 39th edition of Canada’s Farm Progress Show. It is known on the Prairies as the ‘backyard’ showcase for agricultural equipment manufacturers. But outside our own borders, Canada’s Farm Progress Show has become the global destination for the latest in ag technology. Agbor Ndoma, executive director of the Centre for Sustainable Agricultural Development in Nigeria, is one of more than 700 visitors who traveled to Regina from 52 countries this past June to take in the show. He was the first Nigerian delegate in the event’s 39-year history. Ndoma came away exceptionally impressed with the volume of Canadian-made innovation, including with IntraGrain Technologies, a local manufacturer of mobile grain storage monitoring systems. Chris Dekker, president and CEO of the Saskatchewan Trade & Export Partnership, credits the show’s International Business Centre (IBC) with energizing on-site sales. Organizers estimate that exhibitors racked up $500 million in transactions over the three-day period. The IBC is manned by professional staff and volunteer subject matter experts, who work around-the-clock to expedite introductions and meetings between buyers, trade delegations, and manufacturers. Show Manager Shirley Janeczko echoes that sentiment, and says the dichotomy between regional and global buyers is what makes Canada’s Farm Progress Show the ideal stage to introduce new products and technologies. This year, 17 new innovations were spotlighted, while another three formal product launches were held, helping to drive 41,000 attendees through the show gates. 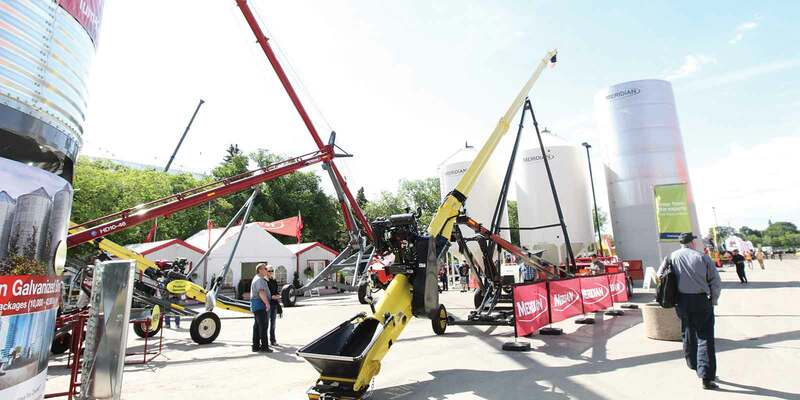 In total, 700 manufacturers, service providers, and support organizations exhibited at the show in 2016 — 81 per cent of which are based in the three Prairie provinces and 14 per cent of which hail from outside the country. With the show’s 40th anniversary now officially less than one year out, planning is already underway to ensure it is the biggest and best yet. Additional outdoor space will be made available near the soon-to-be-completed Mosaic Stadium, and new pavement will be laid. Then, a year later, in 2018, the 150,000-square-foot International Trade Centre is expected to open its doors to Canada’s Farm Progress Show.